Size (Inches): 9 In. X 3 In. X 2 In., 9 In. X 4 In. X 3 In., 12 In. X 4 In. X 2 In. YR Circul Cupola Bricks, Size: 9 In. X 3 In. X 2 In. At Clayman, we manufacture all types of Cupola bricks which are widely used in Cupola Furnace of Foundries. These products are manufactured using optimum grade raw material. 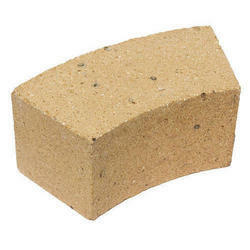 We are offering high quality Cupola Bricks that are used in various furnaces. These cupola bricks are manufactured by us using premium quality alumina and are highly temperature resistant. We provide cupola bricks to the clients as per their required quantity. The price of the cupola bricks differs as per the quantity supplied. Buy cuppola bricks refractory products from Ravani Ceramics which are used in different furnace types industrial applications where high temperature produced. It have ability to with stand against high strength and temperatures. It's available at lowest rates here. To accomplish the numerous requirements of the clients, we are engaged in providing a high quality range of Cupola Fire Bricks. We are offering Cupola Furnace Fire Bricks to our clients. We offer high quality of Cupola Bricks. These bricks are manufactured using high grade material procured from reliable vendors under the supervision of engineered professionals. Our products are acclaimed for their features. We provide Cupola Bricks to our customer. Haryana Ceramic & Allied Products Ind.